People make incredible things in No Man’s Sky: civilizations, bases, and even the face of developer Sean Murray. One fan has now made a fan film set in the universe of the game, with a little help from his daughter, Kinda Funny’s Greg Miller, and Austin Creed, which is the stage name of professional wrestler and video game YouTuber Xavier Woods. Matt Silverman, a professional podcaster and video producer, has been following No Man’s Sky since launch. Although he knows the game had “some hiccups” along the way, he loves it. Though Silverman loves No Man’s Sky, he said he was bothered by the characters’ lack of interior lives. His short fan film, called Nomad Squadron, is inspired by the kinds of stories he wishes he could actually tell in the game. Silverman’s movie also uses green-screened in footage of his 5-year-old daughter Amelia, Greg Miller and Austin Creed. 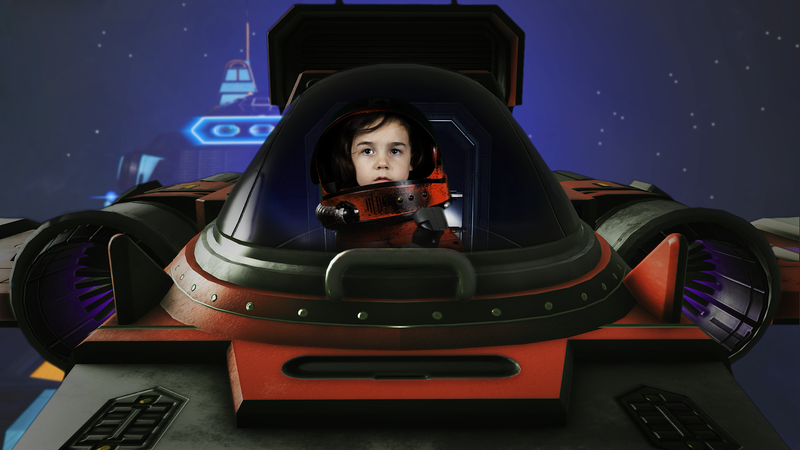 Silverman knew Miller from Twitter, and after Hello Games’ Sean Murray retweeted an animation of Miller talking about how pumped he was for Next, Silverman reached out to Miller to play a wisecracking wingman to his daughter’s character. Miller then introduced Silverman to Creed, who plays a more “analytical and straight-laced” character. Amelia plays a hardboiled, though adorable, starship pilot, and these two are her partners in crime. The short will release in late January on YouTube. If you want to see any more adorable videos of Silverman and his daughter right now, they’re on his YouTube channel, Free Dad Videos.